Laboratories can be challenged by the quantity and variety of flammable and non-flammable chemicals that are stored. Proper regulatory practices are necessary to remain compliant and stay safe in a hazardous atmosphere. When storing hazmat in an enclosed environment, make sure that proper safety accessories are implemented. Proper safety precautions are necessary when handling or storing flammables, combustibles or toxic chemicals. 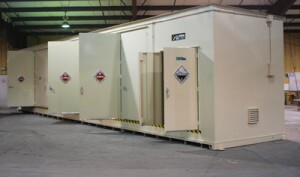 A hazardous liquid storage locker is perfect for hazardous laboratory storage and other hazmat materials. Designed specifically for storing hazardous materials that are used in laboratories or for medical manufacturing operations. Fire rated or non-fire rated for easy relocation. 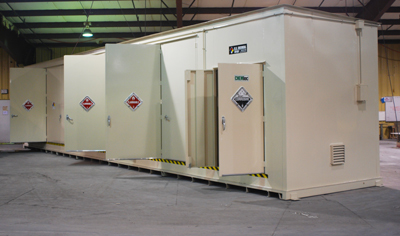 Our fire rated hazardous liquid storage lockers enable close storage of hazardous materials to occupied facilities (less than or equal to 30 feet). All hazardous liquid storage lockers feature a chemical, weather, and UV Resistant 2-Part Coating, inside and outside of the building for complete protection of your inventory. Designed to reduce hazardous situations, explosions, contamination, and costs. When storing hazardous liquids, maintenance and manageability it is a priority in order to keep your inventory completely compliant. U.S. Chemical Storage provides explosion proof and non-explosion proof accessories to manage your hazardous liquid storage safely. Temperature Controls by U.S. Chemical Storage provide a consistent and clean air flow to match your specific temperature request. Choose from refrigeration units, heating units and/or freezer units to compliantly store your hazardous liquids. All temperature control units can be customizable with explosion proof or non-explosion proof accessories. Air conditioning units provide you with controllable settings – ranging from 66°F to 70F°, Refrigeration and freezer units allow controllable settings ranging from -20°F to 65°F, and heating units allow for temperature ranges from 40°F to 175°F. These units are energy efficient, provide rugged construction and ensure protection for hazardous materials and other inventory that is stored in your hazardous liquid storage locker. Contact U.S. Chemical Storage to get fully compliant today.